I thought it might be helpful to owners planning a basement extension, and indeed to those living next door to a proposed basement extension, to provide an overview of party wall procedures with the emphasis on the special characteristics of this type of work. This article could have been two or three times longer but to prevent it from becoming unwieldy I have assumed that you understand the principle of how the Party Wall Act works and have linked out to other articles and additional resources where appropriate. In an article such as this I can only cover the topics in general terms so you will need to discuss how they apply to your particular situation with your surveyor – every job is slightly different but hopefully I’ve provided enough information below to allow you to ask the right questions. The formal process starts with the service of the notices so that would seem like a good place to start this article. A basement extension may include works that are notifiable under 3 separate sections of the Act. I’ll start with the most common; a Notice of Adjacent Excavation (section 6 of the Act) – if there is a neighbouring or shared structure within 3.00m of the proposed basement extension and excavation to a greater depth than the base of the foundations to that structure is proposed this type of notice must be served. Where the proposed foundations are particularly deep, such as with augured piles, the distance is extended to 6.00m. The statutory notice period for this type of work is 1 month. If the property is semi-detached or terraced and the proposed works include underpinning the party wall(s) a Party Structure Notice (section 2 of the Act) must be served. Other works related to a typical basement extension which would be included on a Party Structure Notice include trimming back projections (such as the original brick corbeled footings) and cutting in to the party wall to allow for the insertion of beams. The statutory notice period is 2 months. Finally, if the basement extension goes beyond the footprint of the original property and up to a boundary, a Line of Junction Notice (section 1 of the Act) must be served – typical situations where this might be necessary include the formation of a light well or where the proposed basement extends back under the rear garden. The statutory notice period is 1 month. Although the proposals may be covered by 2 or 3 different sections of the Act notices are invariably served together and any disputes settled in a single award. Special Foundations are simply foundations that are reinforced with metal rods – they are widely used in basement extensions as they allow underpinning to be slimmer and therefore the usable floor area to be greater. For largely archaic reasons special foundations require the express consent of the affected adjoining owner and if the adjoining owner prefers not to give that consent they are not obliged to explain their reasons. It is therefore essential that the issue is discussed early in the process as if consent is not forthcoming the design will have to be changed. The situation has become somewhat muddied by a recent case in the county court (pdf) where a distinction was made between the underpinning and the ‘foundation’ to that underpinning even if that foundation serves no structural purpose. If you are a building owner and intend to rely on this decision I would suggest that you put your appointed surveyor in touch with your engineer as early as possible in the process. It’s also worth noting that if an adjoining owner doesn’t respond to a notice and a surveyor is appointed for them by the building owner that surveyor cannot provide Special Foundation consent on their behalf. The Act confirms that any adjoining owner with an interest of greater than 12 months should be notified if they are affected by the works – that will therefore include freehold and long leasehold owners. Where the property being extended in to the basement is semi-detached or terraced it is not uncommon for adjoining properties to be converted with 2 or more leasehold owners. So, which owners should be notified? The adjoining freehold owner has an interest in the whole building so will need to be notified of any works falling under section 1 (new walls at the boundary), section 2 (work directly to a party wall) and section 6 (adjacent excavation). When it comes to establishing which notices to serve on the leasehold owners it gets quite complicated as the Act is open to interpretation. In my view, section 1 notices should be served on any adjoining owner whose demise includes the land on the other side of the boundary that is being built up to such as the owner of the adjoining garden flat if the proposals include a rear light well with a new wall at the boundary. Section 2 notices should be served on any owners whose demise includes the affected section of the party wall e.g. if a pocket if to be cut in to the party wall to allow a beam to be inserted it would need to be established which flat encompassed that section of party wall. Section 6 notices should be served on those leaseholders whose flats bear upon the foundations that are being undermined (by the adjacent excavation) – this is based upon the theory that flats which are stacked one on top of the other share the same foundations. Other surveyors may interpret the Act differently and it’s tempting for a building owner to serve as few notices as possible to limit costs but that decision needs to be set against the risk of the work having to be put on hold if a leaseholder that has not been notified demands such once the works get going. If time allows I would recommend sequencing the notices where there are multiple adjoining owners i.e. serving on just the adjoining freeholders initially and waiting for a response before notifying the leaseholders. If the freeholder dissents and appoints their own surveyor (and freeholders generally do) that surveyor can arrange access for the schedules of condition to be recorded and that provides an opportunity for the surveyors to meet the leaseholders at their property and discuss the works. When a leasehold owner realises that their flat will be covered in the freeholder’s award they are more likely to consent or at least appoint the same surveyor as their freeholder when they are formally notified (which will be much cheaper for the building owner than having another different surveyor involved). I would estimate that we’ve saved building owners tens of thousands of pounds in fees by adopting this approach over the years. I’ve spoken a bit about the appointment of surveyors already in this article but just to clarify, if an adjoining owner does not consent to the notice(s) they have 2 options; to appoint the same surveyor as the building owner (who would then be referred to as the ‘Agreed Surveyor’) or to appoint a separate surveyor. If an adjoining owner does not respond to a section 2 or 6 notice they are deemed to have dissented 14 days after having received it – the building owner (or their surveyor) must then write a further letter confirming the deemed dissent and requesting surveyor’s details. If those surveyor’s details are not provided within a further 10 days the building owner can make an appointment on their behalf although that rules out the possibility of having an Agreed Surveyor. The building owner is responsible for the reasonable fees of all appointed surveyors. The building owner’s surveyor will generally provide a fixed fee in advance (or possibly an hourly rate with an estimated number of hours) but the adjoining owner’s surveyor fee will not be agreed until all other matters have been resolved. Only very experienced surveyors should act for owners where basement excavation is involved and experienced surveyors will have higher hourly rates. The risk of damage is greater so more time is spent reviewing the proposals and agreeing safeguards. There are more issues involved such as Special Foundation consent, security for expenses (see below) and the need to liaise with advising engineers (see below). The fee will invariably include an interim visit. The adjoining owner’s surveyor’s fee must be agreed between the two surveyors or failing that determined by a previously selected Third Surveyor. 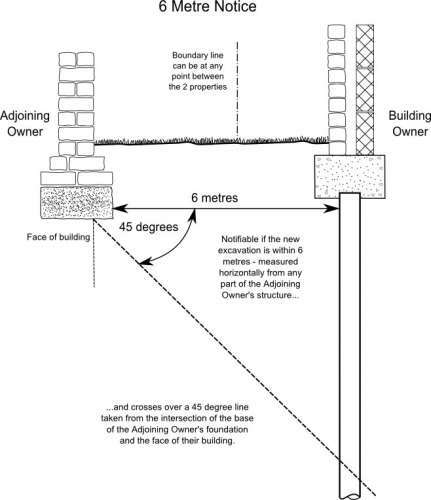 Because of the high level of risk involved in basement excavation and underpinning a party structure it is generally accepted that a surveyor acting for an adjoining owner can seek advice from an independent structural engineer at the expense of the building owner. Where there are several different adjoining owners’ surveyors involved they are not obliged to use the same advising engineer but the building owner’s surveyor should use his/her experience and contacts to try and put forward a name that they can all agree upon as this will make the process less costly and time consuming. The advising engineer will review the structural drawings and calculations and consider whether all reasonable steps have been taken to reduce the risk of damage. On higher risk developments the advising engineer may also suggest that a programme of movement and/or vibration monitoring is set up with the data being regularly fed back to him/her and the appointed surveyors. The advising engineer’s fee must be reasonable and once agreed should be included as a disbursement on the adjoining owner’s surveyor invoice. A schedule recording the condition of the parts of the adjoining property which are at risk from the works is prepared by the surveyors on every party wall matter; the only difference when the works include underpinning and basement excavation is the scope of that schedule. For a loft conversion or a ground level extension surveyors would typically record within a 3 to 4 metre radius of the notified works – on basement and underpinning jobs that measurement should be doubled and extended to all floors. Section 12 of the Act provides a right to request security for expenses. In practical terms that is the adjoining owner requesting that the building owner pay a sum of money in to a designated account so that they are protected in the unlikely scenario that the works are abandoned part way through and the structural stability of their property compromised as a result. The amount of security should equate to the estimated reinstatement cost (to include taxes, fees etc.) if the works stopped at the worst possible point. If a request is made and refused by the building owner it becomes part of the dispute to be resolved by the appointed surveyors. The purpose of security is not to cover potential damage as such is not quantifiable and would therefore have to equate to the entire rebuilding cost of the adjoining property (which would be unreasonable). Having said that, if a payment in lieu or repair has already been agreed and is owed to an adjoining owner it would make sense to deduct that payment from the security which is being held and an award may anticipate such a scenario. The security is held in a designated account which is out of reach of the owners – that might be an account set up by one of the appointed surveyors, another surveyor or more commonly the client account of a solicitor (although the SRA rules changed last year so that holding the money has to be ancillary to another transaction such as providing advice to the building owner). The security is returned to the building owner when the work it relates to is completed. Any disputes relating to the release of the security are also resolved by the appointed surveyors. As property prices rise and more basement extensions are constructed it is becoming a fairly frequent occurrence for a new basement to be dug out adjacent to an existing basement and for the former to make use of the latter’s underpinning. Section 11(11) of the Act confirms that where an owner subsequently makes use of work paid for by an adjoining owner they must make a fair contribution; that contribution will generally equate to 50% of the construction cost using rates applicable when the use is made. If the figure is in dispute between the owners (or more likely they just don’t know what it should be) it should be agreed by the surveyors and confirmed in the award. A potential problem when making use of existing underpins is overspill concrete i.e. where the underpinning projects further on to the adjoining owner’s land than agreed. The problem only becomes apparent when the adjoining owner (then ‘building owner’) digs out their basement and has to cut the overspill back. Good practice would be for either a sacrificial back shutter to be used or for any over dig to be packed and separated from the main body of the underpin but such is not always picked up or adhered to by the contractor. Interim visits are something of a grey area with party wall procedures. It is generally accepted that a party wall surveyor’s role does not extend to policing the works but also that they are entitled to access the building owner’s property at all reasonable times to check on the progress of the works. Typically, the adjoining owner’s surveyor will make 1 interim visit at a critical point (I like to time it for mid-way through the underpinning) to ensure that everything is being done as agreed. If problems arise further visits could be justified and of course the Local Authority Building Inspector will visit at key stages of the build. When the works are complete the adjoining owner’s surveyor will return to check through the schedule of condition and hopefully confirm that no significant damage has occurred. That inspection does not tend to take place until all of the works are finished as by that point the excavation has been complete for several months and the disturbed ground has found it equilibrium again. There is a high risk of damage being caused to adjoining properties as a result of basement excavation and underpinning party structures; indeed, in some cases minor damage (BRE category 0 to 1) is inevitable. The building owner has a duty to make good but as with all damage resulting from works covered under the Act section 11(8) gives the adjoining owner the right to request a payment in lieu of that making good. If either the cause of the damage or the quantum of the payment in lieu are in dispute between the owners that dispute is resolved by the appointed surveyors. One other point to bear in mind is that basement extensions can take 18 months or more to complete where they are large or complex, and that is a long time in the life of an adjoining property. It is possible that cracking caused by settlement or shrinkage rather than the party wall works could occur over that period. It is part of the surveyors’ role to determine the difference between cracking that is and is not related to the works. If you are planning a basement extension or have been notified of basement or underpinning works at a neighbouring property and would like some advice on party wall procedures you are welcome to contact the author of this article, Justin Burns BSc(Hons) MRICS FFPWS, on 020 7183 2578 or by email.